1 of 2 Chicken Mix together hot sauce, broth and lemon juice. Place chicken in a large ziptop bag and add hot sauce mixture. Seal and shake bag to coat chicken. Refrigerate 8 to 24 hours. 2 of 2 Heat gas grill to medium-high or prepare charcoal grill with medium-hot coals. Lightly coat rack with oil or cooking spray. 1 of 2 Place zucchini and corn on grill and cook for 10 to 12 minutes, turning a few times. 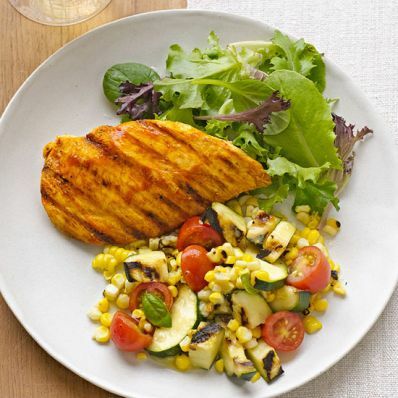 Meanwhile, add chicken and grill for 3 minutes per side or until internal temperature registers 160 degrees F.
2 of 2 Cut kernels from cobs and place in a medium-size bowl; cut zucchini into bite-size pieces and add to bowl. Add tomatoes; season with salt and pepper. 1 of 2 Stir balsamic vinegar, mustard, garlic salt and pepper together in a small bowl. Gradually whisk in oil. 2 of 2 Dress greens with 3 tablespoons of the dressing. Drizzle remaining dressing over vegetables and serve with chicken. Per Serving: 20 g Fat, total, 19 g carb., 3 g sat. fat, 99 mg chol., 5 g fiber, 447 mg sodium, 43 g pro., 417 kcal cal.